Assistant Kitchen Manager takes charge of various tasks pertaining to kitchen maintenance and food preparation. Assistant Kitchen Managers have many responsibilities and are more likely to undertake the following job duties – cleaning and maintenance tasks, providing cooks with the needed kitchen items, sanitizing food station, rotating foodstuffs in fridge, keeping dispensers and the shelves stocked, preparing plates and cutlery, cleaning and butchering meat, mixing ingredients and correctly storing the food. At times these assistant kitchen managers are involved in food preparation under the supervision of a head chef or manager. 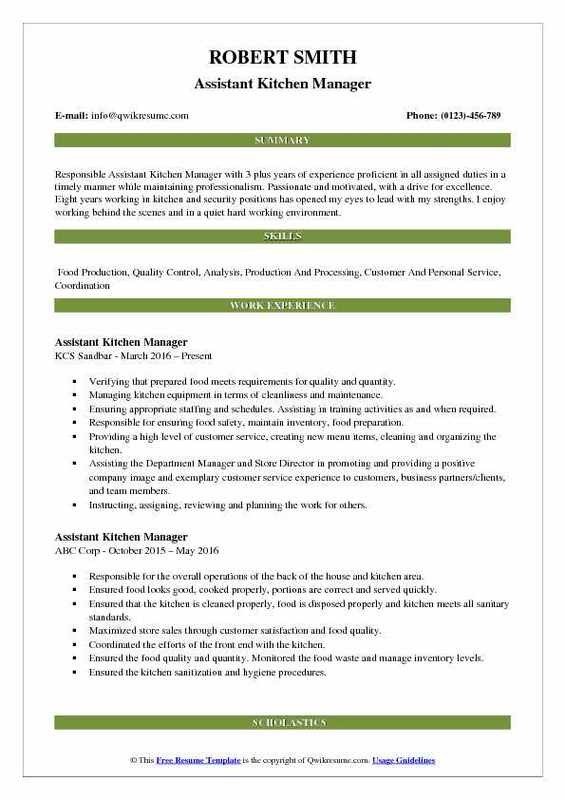 A well written Assistant Kitchen Manager Resume focuses on skills such as – good understanding and communication capacity, supervisory skills, physically strong and fit enough to withstand long working hours and heavyweight lifting abilities. 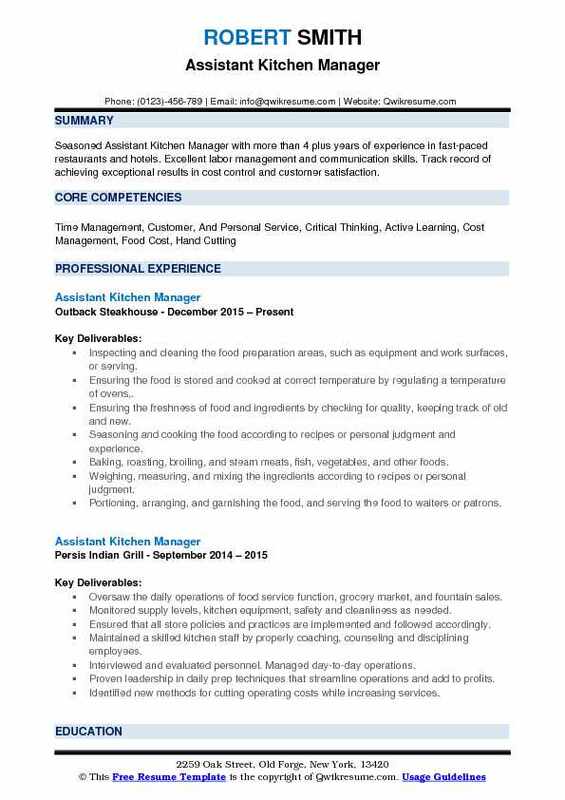 No formal education is regarded as mandatory for this job post; however, many of the employers prefer their Assistant Kitchen Managers to have a prior experience in food preparation or hospitality. Summary : Assistant Kitchen Manager IV with 28 plus years of experience, effective at building highly-motivated teams, as well as leading cross-functional teams in a fast-paced environment. Enthusiastic restaurant professional with expertise in mixology, beer, liquor and wine along with a solid background in team leadership and business decision making. Organized special events in the restaurant, including receptions, promotions, and corporate luncheons. Clearly and promptly communicated pertinent information to staff, such as large reservations or last-minute menu changes. Developed, implemented and managed business plans to promote profitable food and beverage sales. Maintain high standards in cleanliness, sanitation, and food standards in a high volume restaurant. 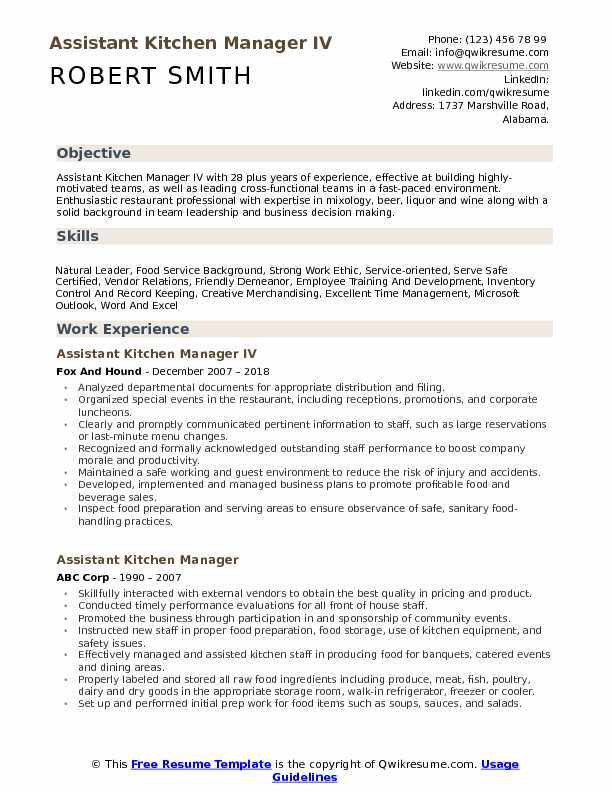 Objective : Seasoned Assistant Kitchen Manager with more than 4 plus years of experience in fast-paced restaurants and hotels. Excellent labor management and communication skills. Track record of achieving exceptional results in cost control and customer satisfaction. Inspecting and cleaning the food preparation areas, such as equipment and work surfaces, or serving. Ensuring the food is stored and cooked at correct temperature by regulating a temperature of ovens,. Ensuring the freshness of food and ingredients by checking for quality, keeping track of old and new. Seasoning and cooking the food according to recipes or personal judgment and experience. Baking, roasting, broiling, and steam meats, fish, vegetables, and other foods. Weighing, measuring, and mixing the ingredients according to recipes or personal judgment. Portioning, arranging, and garnishing the food, and serving the food to waiters or patrons. 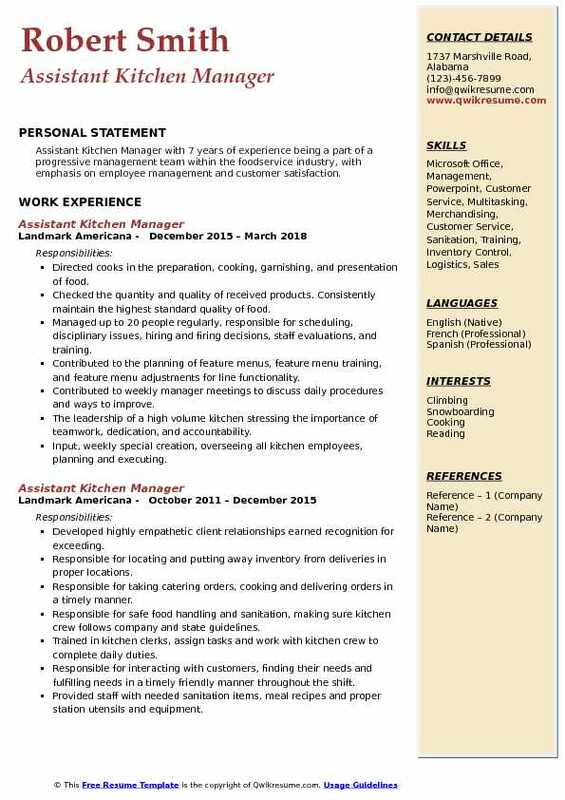 Objective : Responsible Assistant Kitchen Manager with 3 plus years of experience proficient in all assigned duties in a timely manner while maintaining professionalism. Passionate and motivated, with a drive for excellence. Eight years working in kitchen and security positions has opened my eyes to lead with my strengths. I enjoy working behind the scenes and in a quiet hard working environment. Verifying that prepared food meets requirements for quality and quantity. Managing kitchen equipment in terms of cleanliness and maintenance. Ensuring appropriate staffing and schedules. Assisting in training activities as and when required. Responsible for ensuring food safety, maintain inventory, food preparation. Providing a high level of customer service, creating new menu items, cleaning and organizing the kitchen. Assisting the Department Manager and Store Director in promoting and providing a positive company image and exemplary customer service experience to customers, business partners/clients, and team members. Instructing, assigning, reviewing and planning the work for others. Maintaining standards, coordinating activities and allocating personnel. 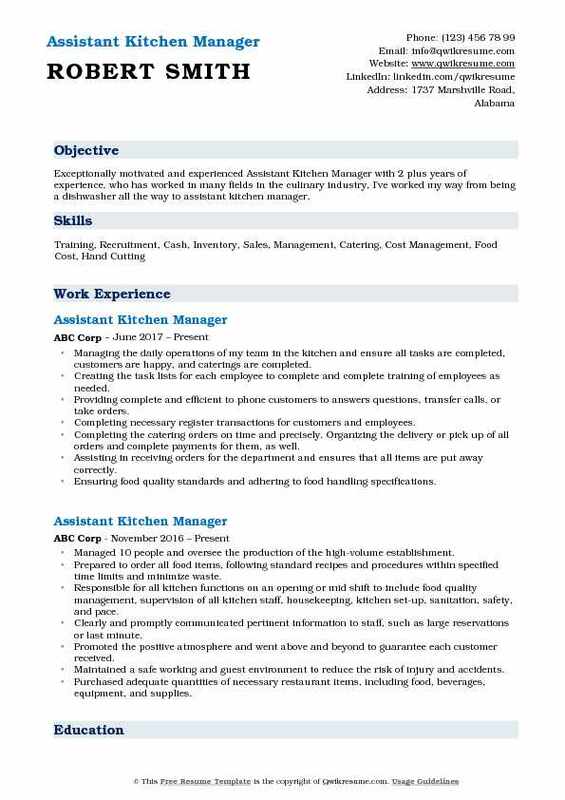 Summary : Assistant Kitchen Manager II with 18 years of experience and with expertise in general operations management, special events, staff development and training, recruitment and vendor negotiations. Flexible, results-oriented Manager offering focused leadership and restaurant operations knowledge to drive profitability. Purchased adequate quantities of necessary restaurant items, including food, beverages, equipment, and supplies. Promoted the positive atmosphere and went above and beyond to guarantee each customer received. Recommend process changes to increase the efficiency of operations and service to customers. Handled all back of house operations and enforced company policies to ensure quality control and minimal waste. 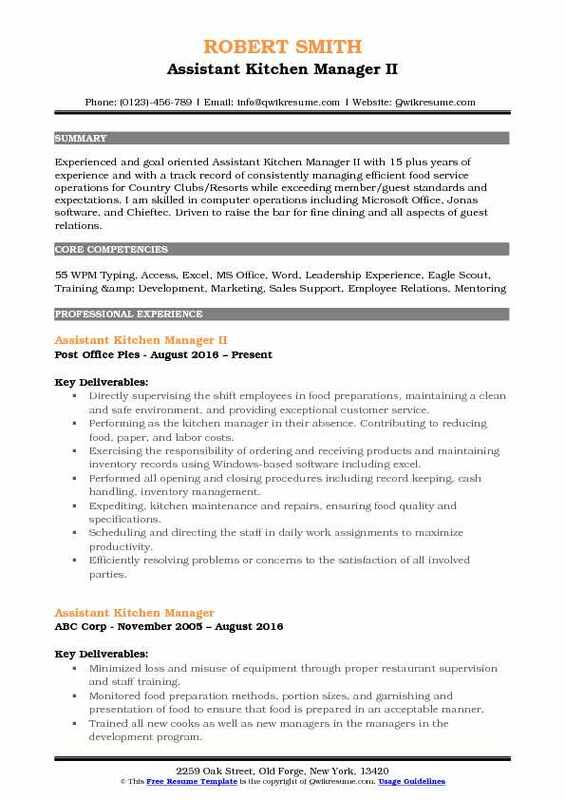 Summary : Seasoned Assistant Kitchen Manager with 19 years of experience with a passion for details and quality customer care. Previously managed and organized large-scale events, including weddings and banquets, special events. Clearly and promptly communicating the pertinent information to staff. Interacting positively with customers while promoting facilities and services. Organizing special events including receptions, promotions, and corporate events. Actively participated in ongoing customer service programs to build sales. Maintaining a safe working and guest environment to reduce the risk of injury and accidents. Skillfully interacting with external vendors to obtain the best quality in pricing and product. Meeting, greeting and encouraging feedback from customers and using the feedback to implement positive changes within the restaurant. Consistently reducing the food cost by updating procedures on proper food storage. Managing the weekly produce and main food supply orders along with all deliveries. Objective : Exceptionally motivated and experienced Assistant Kitchen Manager with 2 plus years of experience, who has worked in many fields in the culinary industry, I've worked my way from being a dishwasher all the way to assistant kitchen manager. Managing the daily operations of my team in the kitchen and ensure all tasks are completed, customers are happy, and caterings are completed. Creating the task lists for each employee to complete and complete training of employees as needed. Providing complete and efficient to phone customers to answers questions, transfer calls, or take orders. Completing necessary register transactions for customers and employees. Completing the catering orders on time and precisely. Organizing the delivery or pick up of all orders and complete payments for them, as well. Assisting in receiving orders for the department and ensures that all items are put away correctly. Ensuring food quality standards and adhering to food handling specifications. Ordering, tracking, and organizing all inventory. Receiving and examining food items and supplies to ensure quality and quantity requirements. 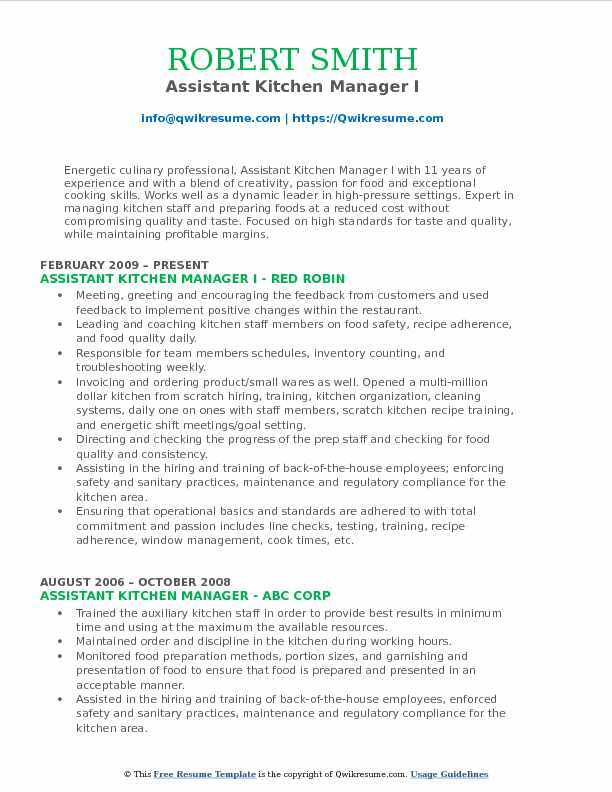 Summary : Energetic culinary professional, Assistant Kitchen Manager I with 11 years of experience and with a blend of creativity, passion for food and exceptional cooking skills. Works well as a dynamic leader in high-pressure settings. Expert in managing kitchen staff and preparing foods at a reduced cost without compromising quality and taste. Focused on high standards for taste and quality, while maintaining profitable margins. Meeting, greeting and encouraging the feedback from customers and used feedback to implement positive changes within the restaurant. Leading and coaching kitchen staff members on food safety, recipe adherence, and food quality daily. Responsible for team members schedules, inventory counting, and troubleshooting weekly. Invoicing and ordering product/small wares as well. Opened a multi-million dollar kitchen from scratch: hiring, training, kitchen organization, cleaning systems, daily one on ones with staff members, scratch kitchen recipe training, and energetic shift meetings/goal setting. Directing and checking the progress of the prep staff and checking for food quality and consistency. Assisting in the hiring and training of back-of-the-house employees; enforcing safety and sanitary practices, maintenance and regulatory compliance for the kitchen area. Ensuring that operational basics and standards are adhered to with total commitment and passion: includes line checks, testing, training, recipe adherence, window management, cook times, etc. 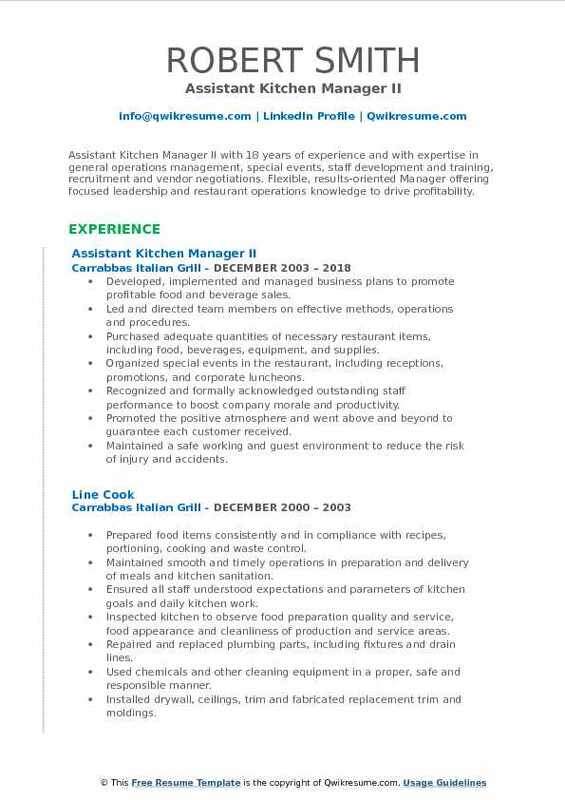 Summary : Experienced and goal oriented Assistant Kitchen Manager II with 15 plus years of experience and with a track record of consistently managing efficient food service operations for Country Clubs/Resorts while exceeding member/guest standards and expectations. I am skilled in computer operations including Microsoft Office, Jonas software, and Chieftec. Driven to raise the bar for fine dining and all aspects of guest relations. Directly supervising the shift employees in food preparations, maintaining a clean and safe environment, and providing exceptional customer service. Performing as the kitchen manager in their absence. Contributing to reducing food, paper, and labor costs. Exercising the responsibility of ordering and receiving products and maintaining inventory records using Windows-based software including excel. Performed all opening and closing procedures including record keeping, cash handling, inventory management. Expediting, kitchen maintenance and repairs, ensuring food quality and specifications. Scheduling and directing the staff in daily work assignments to maximize productivity. Efficiently resolving problems or concerns to the satisfaction of all involved parties. Continuously monitoring the restaurant and took appropriate action to ensure food quality and service standards were consistently met. Run all kitchen positions in the restaurant while supervising other positions and maintaining efficient service to customers. Write product orders, make recipes for weekly specials, ensure all equipment is working properly. 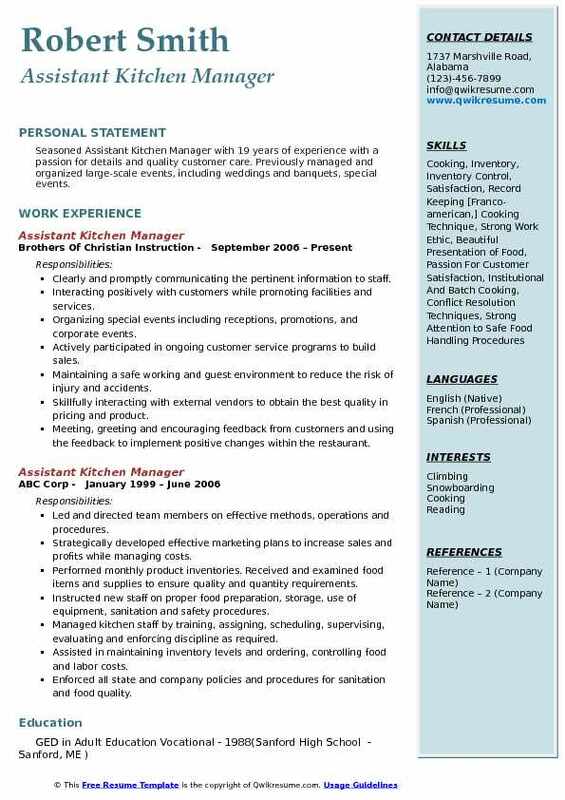 Summary : Assistant Kitchen Manager with 7 years of experience being a part of a progressive management team within the foodservice industry, with emphasis on employee management and customer satisfaction. Directed cooks in the preparation, cooking, garnishing, and presentation of food. Checked the quantity and quality of received products. Consistently maintain the highest standard quality of food. Managed up to 20 people regularly, responsible for scheduling, disciplinary issues, hiring and firing decisions, staff evaluations, and training. Contributed to the planning of feature menus, feature menu training, and feature menu adjustments for line functionality. Contributed to weekly manager meetings to discuss daily procedures and ways to improve. The leadership of a high volume kitchen stressing the importance of teamwork, dedication, and accountability. Input, weekly special creation, overseeing all kitchen employees, planning and executing. Scheduled 30 employees, daily ordering, monthly inventory, interviews as needed, filing, data. Promptly responded to staff, customers, vendors with needs of concern. 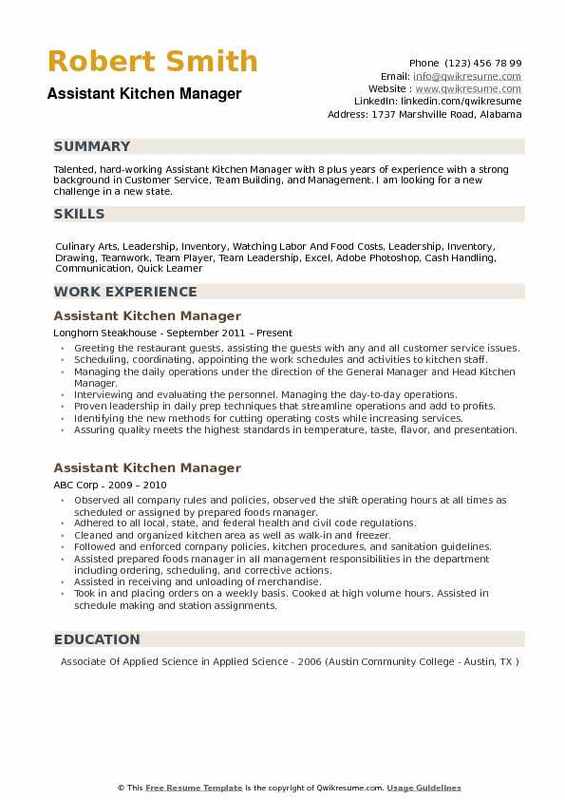 Summary : Talented, hard-working Assistant Kitchen Manager with 8 plus years of experience with a strong background in Customer Service, Team Building, and Management. I am looking for a new challenge in a new state. Greeting the restaurant guests, assisting the guests with any and all customer service issues. Scheduling, coordinating, appointing the work schedules and activities to kitchen staff. Managing the daily operations under the direction of the General Manager and Head Kitchen Manager. Interviewing and evaluating the personnel. Managing the day-to-day operations. Proven leadership in daily prep techniques that streamline operations and add to profits. Identifying the new methods for cutting operating costs while increasing services. Assuring quality meets the highest standards in temperature, taste, flavor, and presentation. Managing a kitchen staff of 25 people, while managing labor, ordering product, and completing necessary paperwork on a daily basis. Creating a culture inside the kitchen to maximize the quality of food while maintaining a positive working environment among the staff.